Grow fuel in your field. A lot of fuel. 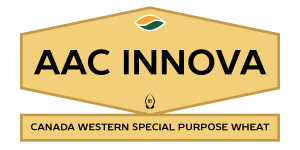 AAC Innova CWSP has shown class leading yields, with agronomic features including short, strong straw to ensure that big bushels do not require a big time commitment at harvest. With soft white wheat ­parentage, low protein, and high starch content, AAC Innova is the coveted variety of choice for ethanol production across the prairies.